This year we are renting out the whole of Trullo Azzurro. This meant that opening up was more than the usual tasks of airing the mattresses in the courtyard and doing some tidying of the flowerbeds. We needed to remove all our personal possessions, transferring them to Sotto Le Stelle, and checking that Trullo Azzurro had all the equipment our guests need. Sometimes we bought new replacements for stuff we'd moved - like new pans to replace our Le Crueset pots - and sometimes we left our stuff and bought new for our apartment - like a compact Bose Soundlink Mini and left them our Sony music system. We also boughts bits and pieces like more mugs, a second drying rack and two first aid kits. The first evening we went straight out with the Italian usual suspects for a meal. Il Cucco was full so we went to the excellent Mezzofanti. My starter was an unusual and tasty dish of artichokes in a truffle sauce with egg. On Sunday morning we moved the first tranche of stuff then went over to Kath and Richard's place for a long, relaxed Italian lunch. By the evening we only need at light supper so we went back to Il Cucco for a single course pasta supper with a couple of glasses of Puglian wine. In the local village of Trito they hang large dolls that look like witches starting on Ash Wednesday . This is a Puglian tradition and these witches represent our sins according to Google. Not a witch, I am informed by a local, but an old woman as a reminder that you are giving up something for Lent. Back at Sotto Le Stelle we finally have hot water so we did not have to return to Trullo Azzurro for showers. The underfloor heating was turned on for us a couple of days before so everything was lovely and warm. Also we could use the hob for cooking - essential for heating milk for Mary's caffe latte. We need new business cards now we are renting out the entirety of Trullo Azzurro. So we took some pictures showing both halves of the property. As usual Puglia provided sunshine and blue skies. This time there were some little fluffy clouds which makes a change from the standard pure blue that looks so unsullied it looks photoshopped. All is in place for our first guests due in three weeks time. "The stretch of the Hogsmill River which runs through the Knights Park campus has been heavily engineered in the past, making it overly wide and lacking in habitat and a natural meandering form. Well, we are now doing something about it! With the help of the South East Rivers Trust we have already started to encourage a more natural river course by installing timber deflectors. 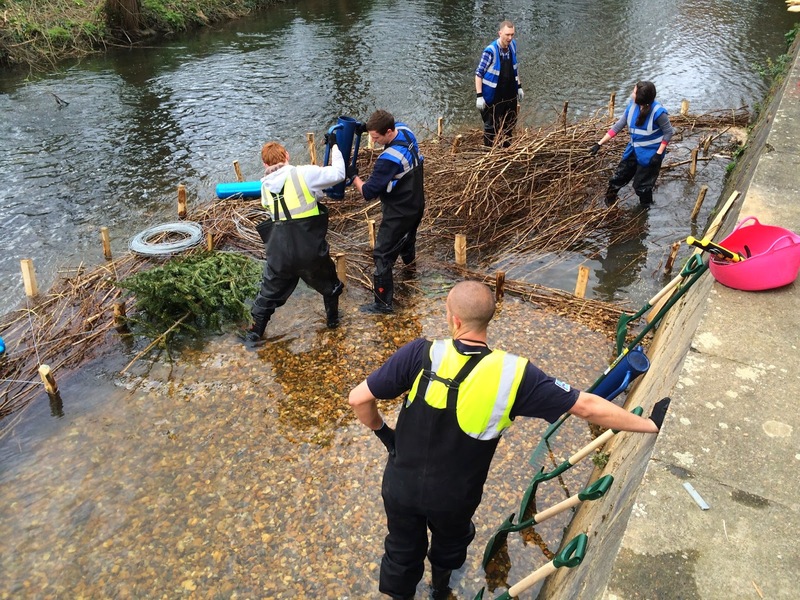 The overall aim is to increase habitat provision and enhance the appearance of the riverside environment." The second phase is the bulk of the work. Create a marginal wetland habitat which will further help the river by narrowing the excessively wide channel. This will be achieved by installing brash and introducing gravel. The final phase will be planting the wetland up with a variety of native species (Wed 02-April-14, 10am-4pm). "During this second phase, we will be installing brash (small woody debris) and gravels to narrow the river channel and create areas to plant up next month. We will be staking in chestnut posts using post-knockers, then pinning brash to it using strong wire and fencing staples. Gravels will be tipped from wheelbarrows into the river and manoeuvred to sculpt banks in and around the woody material. No prior experience is necessary, just a willingness to muck in (and maybe get wet)!" This was the third day of the second phase, three day event. First up we had to move the last of the 40 tonnes of gravel which took half the volunteers up to lunchtime. After lunch those not installing the marginal habitat were on litter picking duty both on the banks and in the river. By the end of the day all was in place. 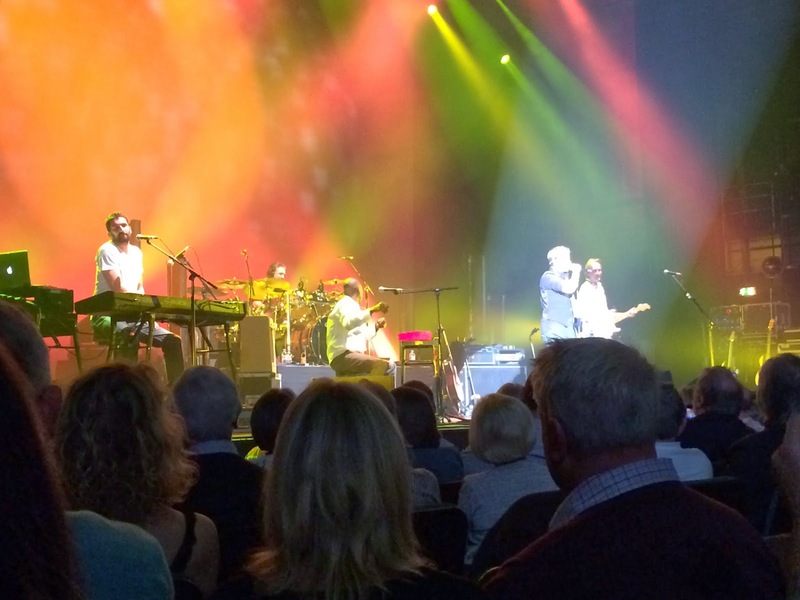 A friend of a friend had a spare ticket for Mike and The Mechanics - part of a tour celebrating 25 years since the release of "The Living Years" so I snapped it up. Mike and The Mechanics were responsible for me buying a CD player. I had two earlier vinyl albums but "Beggar on a Beach of Gold" was only available on CD so I had to go out and buy a player. I went with the best I could afford, a Meridian 206, which cost over a grand in 1995 and still going strong. Four of us met up for a meal beforehand at The Gate - a superb vegetarian restaurant. I had a delicious beetroot ravioli starter and a risotto primavera for main. The others all raved about their choices; I must go there with Mary sometime soon. Off to the venue where we caught the tail end of the support act: Sadie and the Hotheads. 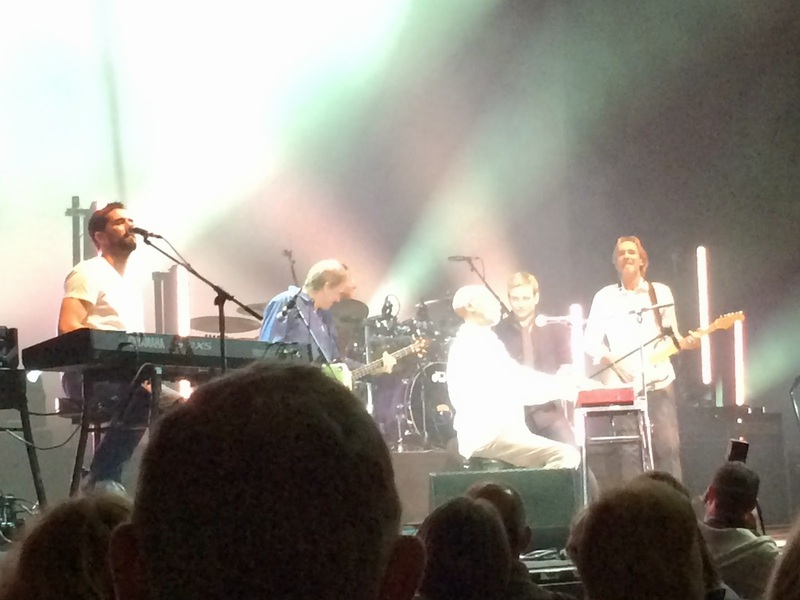 When Mike and The Mechanics came on they launched straight into "Beggar on a Beach of Gold". They continued with a set packed with "The Best of...": the song list took in "Another Cup of Coffee" and "The Living Years", amongst others, right through to audience participation in the encore of "Word of Mouth" (full setlist). A brilliant concert with very good seats (Stalls, Row H). Thanks to Julie for the ticket and Julie, Grant and Helen for the convivial company. Wraysbury, Royal Borough of Windsor and Maidenhead. Saturday 15-Mar-13. 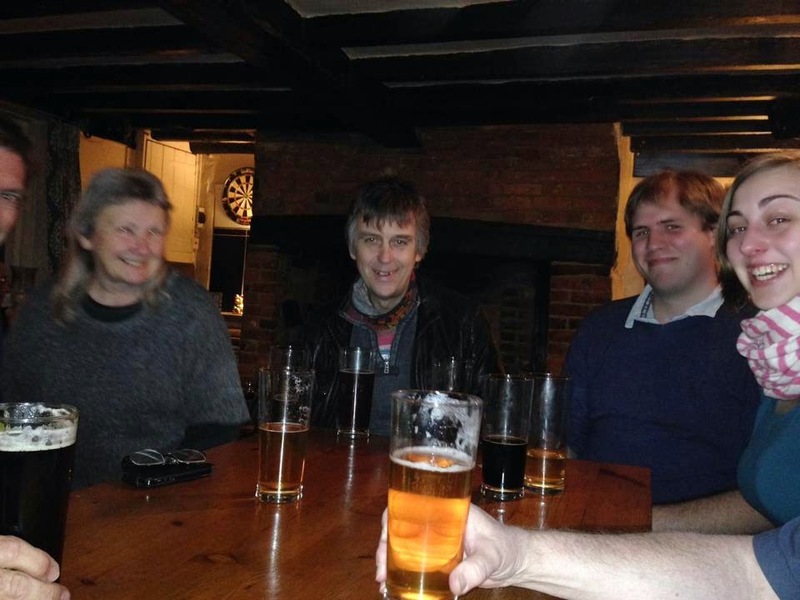 Tony, a friend and ex-colleague, invited us round as his local pub was having a beer festival. We could have taken the train but it was such lovely weather we decided to cycle. Are we mad? The first part of the journey was through various parks until we reached Hampton Court where we picked up the Thames Path. We followed that as far as Staines and a final stretch of road into Wraysbury. Mary is faster than me on the flat. By about an hour and a half in my thighs were starting to flag but had no choice but to carry on. There was a head wind and we were on gravel paths so we only managed an average of 9.3 mph: distance 25.7 miles, time 2:44. We had soup and bread at Tony and Terri's then strolled down to The 'Percy'. They planned to have an interesting range of beers including brews from Windsor and Eton, Dark Star, Langham, Tom Wood, Mordue, Rudgate, Black Hole, Ilkley, Bristol Beer Factory, Titanic, Saltaire and Kelham Island amongst others. They also had a live band, The Sam Kelly Band, playing an eclectic mix of AOR. They did a six-pint deal so Mary and I had three apiece. Most of Tony's friends we had not met before but that didn't stop us having lively and enjoyable conversations. We started in the garden but moved inside after the first pint as it was cooling down. Plenty of room inside a proper English pub with a decent range of real ales - every village should have one. Tasty beers, good company, live music - what more could you ask for? It's official - we have seen Marcus more than any other artist, six times now, pushing Van Morrison into second place at five times. At three times there are a number of other artists: Marc Bolan, Taj Mahal, Mike West etc. We had a delicious Greek meze at Andy's Taverna just around the corner as the gig didn't start till 10pm. The set menu starters were good, then a fish course then some superb grilled meats: chicken, lamb and two types of sausage, after which the kleftiko final course arrived as we were fit to burst. Marcus was excellent as usual and this time I was once of the regulars - I knew all the songs as soon as he started each one. He played for an hour and a quarter to an appreciative audience. 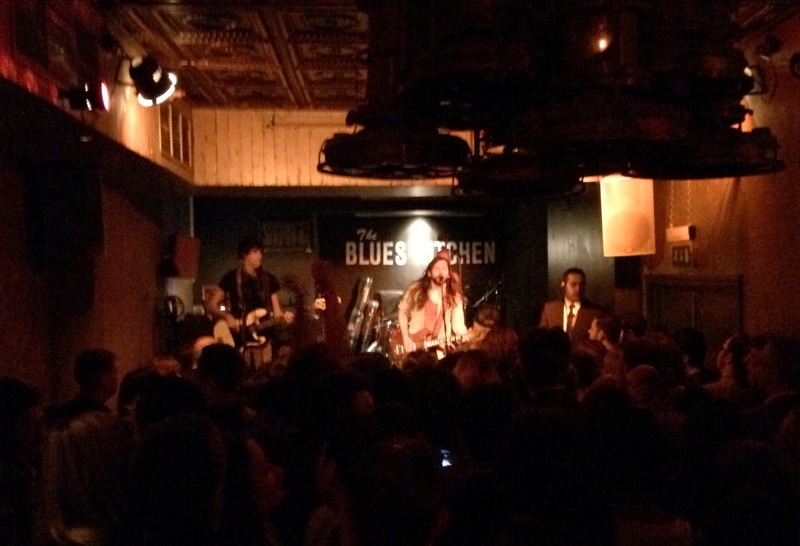 I cannot say that The Blues Kitchen is my favourite venue: so packed that moving about was difficult, too dimly lit and the PA / sound system was struggling with the volume it was being played at. I had my earplugs with me and used them so my ears were not ringing when we left. We left about 11:30 and Camden was heaving; North London is very different to South London. I cannot image any area south of the river with such busy street life at that hour. The tube is just around the corner and whizzed us back to Waterloo and train home. This month was a mega-clean up in Poulter Park in conjunction with a number of other organisations, not just the Wandle Trust. The Wandle Valley Regional Park Trust was the coordinating body with representatives from the Wandle Valley Forum, Sutton Council, Merton Council, London Wildlife Trust, Merton Conservation Volunteers, the Environment Agency and of course all us Wandle Trust volunteers. It was a land based, litter picking day as the river was not safe to enter. The river may look fine but the water was deep and fast because of the rains. Also it was full of toilet paper and sewage from the Beddington sewage treatment works. The storm tanks used for settlement were overflowing also because of the recent rains and E.Coli levels in the river are high (see Pollution alert: Storm flows from Caterham Bourne through Beddington sewage treatment works). The banks were not too bad in terms of litter levels, mostly wind blown rather rather than dumped, but still enough to keep us all busy. Our friends Kate and Nigel came along for this clean-up and Mary cycled down to join us at lunchtime to say hello then cycled back again. There were some lovely ponds alongside the river. I am guessing these might form part of the proposed watermead. This one was home to two patches of frogspawn - at least I guess it is frogs but I am no expert on amphibian eggs. I cannot remember the last time I saw frog spawn. It would not be a clean up without the obligatory shopping trolley. Other mandatory items include bikes, car parts, scaffolding poles, carpet and motor bikes all of which duly appeared. Although we were missing a mattress and child's toy we did get a Christmas tree complete with star. 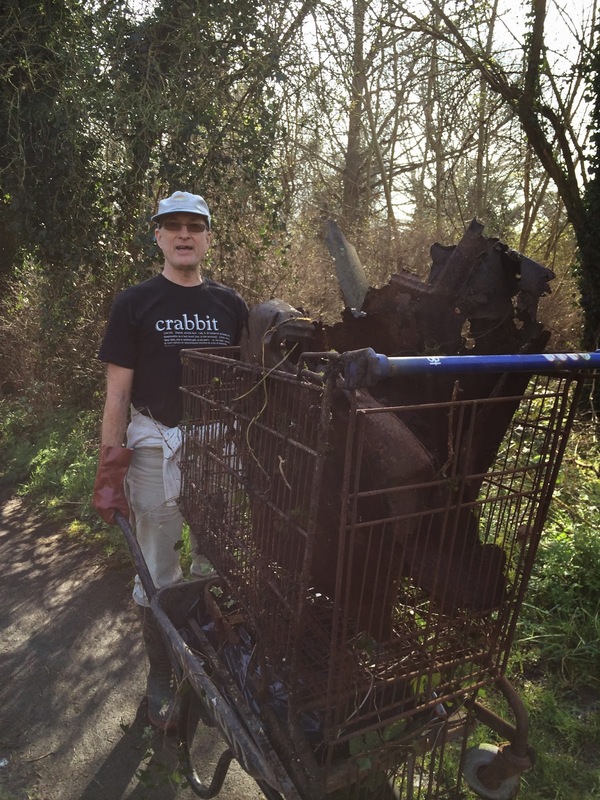 My inner caveman was disappointed not to go grunting into the water and heaving heavy stuff out but the lovely sunny weather and heaps of litter harvested made for a very pleasant and satisfying day out. 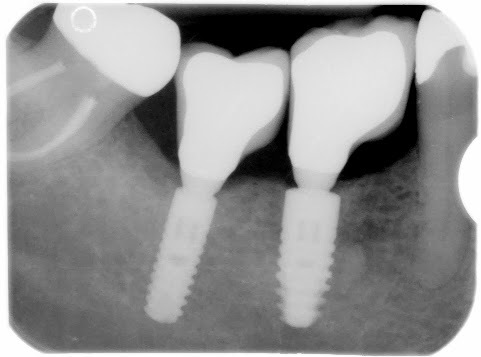 Part two of the implants - a return visit to fit the crowns. This finally fixes a gap that has been there since 1989 when a previous dentist made butchery of an extraction of the lower right 7 molar. It was that extraction that sent me to Harley Street in search of the best dentist I could find. As a consequence I have invested in some fine dental work in the intervening years. 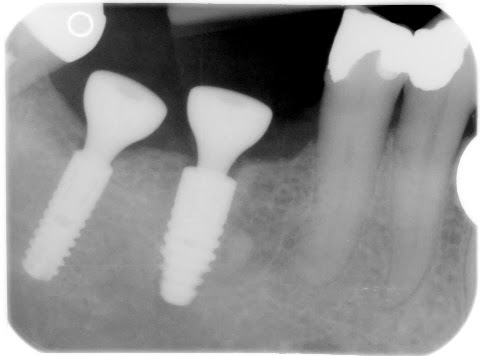 The eventual failure of the lower right 6 molar meant it was time for implants to fill the gap. I am sure that implant practice will have improved in the intervening decades so the wait was probably beneficial. The previous visit involved taking accurate casts with the temporary "golf tees" replaced by the pegs that would provide the final support. Casts and pegs went off to the dental laboratory for construction of the new crowns. An X-ray with the new crowns installed. I was pleased to note that screwing the pegs into the implants used a torque wrench so that there was no danger of over-tightening. The crowns had to be cemented into place in the correct sequence because the angles meant the 7 had to go in before the 6 otherwise they wouldn't fit. Plan view of the new crowns. The fit was micron perfect. I can tell by the way the upper and lower teeth all meet simultaneously when I put my teeth together - like Swiss engineering. It still feels odd eating on the right hand side. I am having to make a conscious effort to chew on that side; I am sure normal eating will soon be resumed. We went from The Commitments at The Palace Theatre to this gig via Beachcomber bar in Queensway for Happy Hour with our friends Nigel and Kate. A couple of cocktails and then we were off to Under the Bridge to grab pole position. My mates at college were big Zappa fans but I was never that convinced at the time; I was more into listening to T.Rex, Bowie and Roxy Music. However subsequently I have listened to a lot more jazz so my tastes have broadened. A couple of days beforehand Mary and I listened to a Frank Zappa greatest hits CD to get our ears in the mood. The GrandMothers of Invention comprised three of the original Mothers of Invention line-up with additional band members. This is the first gig of their "Freak Out / The Early Zappa Years" Tour in which they perform songs from the first ten Zappa records. Obviously I will never see Frank Zappa on account of him being dead but having three actual, original band members is enough for me to consider The Mothers of Invention ticked off the musical bucket list. David Parlato (with the Mothers of Invention-Hot Rats-Grand Qazoo-Petit Wazoo from 1972 thru 1976) on electric bass. "Mad" Max Kutner - electric guitar, what nots, pedals, hats and hair. As often at gigs the songs were well known to the devotees but to me they were all first time of hearing. Because of that I could not tell you which compositions were on the set list (apart from "Call Any Vegetable"). If it is not damning with faint praise, I enjoyed it more than I was expecting. Suitably eccentrically Zappa-esque, it was an excellent concert and they are very accomplished musicians. Part of the concert on YouTube. We lunched beforehand at The Spice of Life pub and music bar. It is proper pub with a small selection of real ales, reasonable food and not too crowded - surprising given its location in the heart of tourist London - although it was filling up by the time we left. A friend had described the first half as a bit slow and then it picked up for the second half. That is about right: the first half has more plot and character development, the second half is more out-and-out musical with little exposition. Both agreed with us that Killian Donnelly as Deco is a serious talent with a serious voice. Two hours of soulful entertainment. 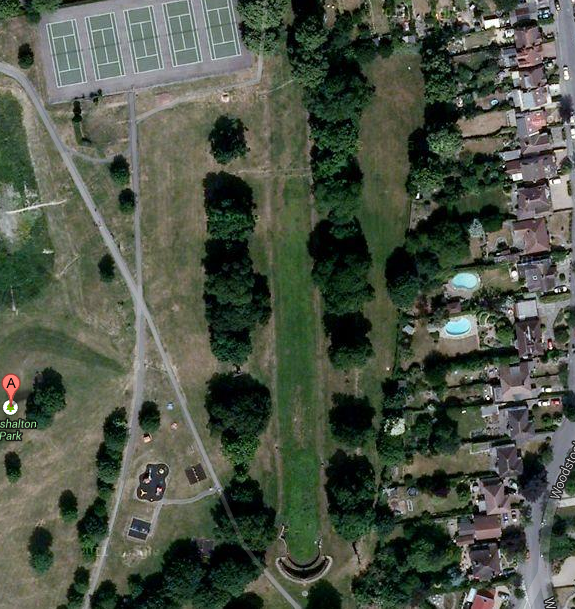 "The source of the River Wandle has started flowing again for the first time in at least 15 years. 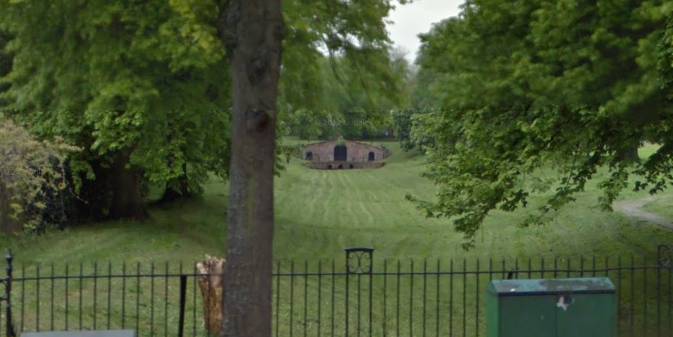 The Wandle's original source is at the grotto in Carshalton Park off Ruskin Road but the water has not actually flowed from there several years. However, recent heavy rains means the section of the river is flowing once again." 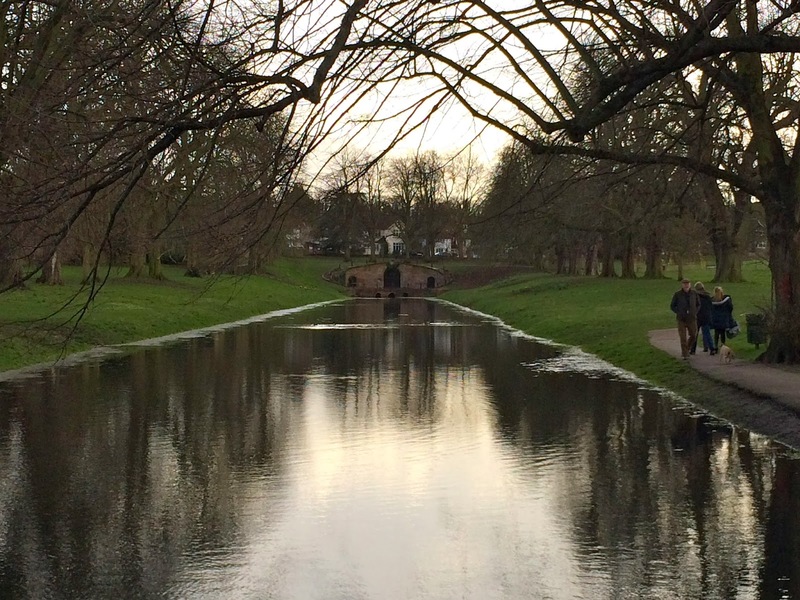 Then and now: River Wandle source flows for the first time in 15 years. Now it is full of water the whole length of the channel. The grotto itself is a Grade II Listed building [English Heritage Building ID: 206793]. It was built in about 1724 as one of the first features of the ambitious designs for building and landscaping in the park [Wikipedia]. It was getting a bit chilly so I wimped out of the return cycle and caught the train back to Clapham Junction.